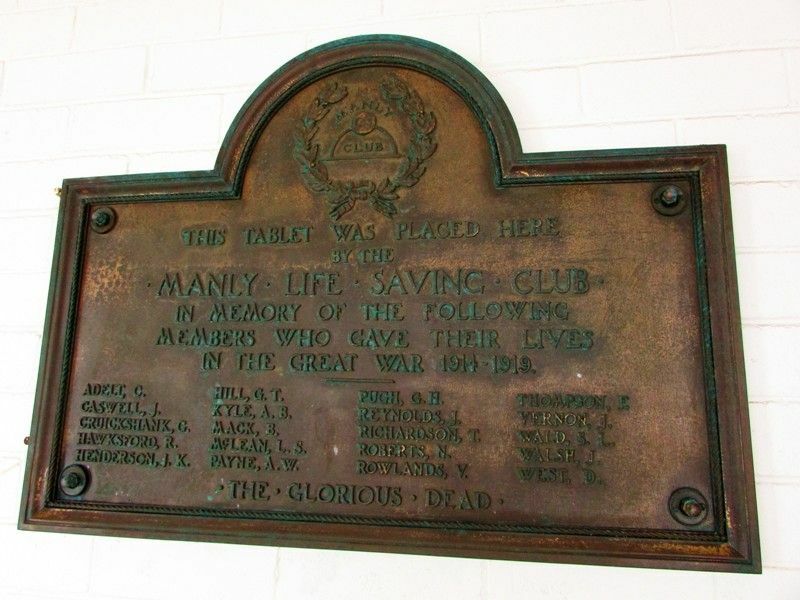 Manly Life Saving Club Memorial Tablet honours those from the club who lost their lives in World War One. Thousands of people assembled in front of the Manly Life Saving Club's premises yesterday afternoon to witness the ceremony of unveiling a tablet erected to the memory of 20 Manly men killed in the war. A large number of Boy Scouts and Girl Guides also attended. Major-General Sir Granville Ryrie, M.P., said it was well that they should erect these memorials, and keep green the memories of brave men. Without referrlng to senior officers, who had very grave responsibilities, he would say that the boys in the ranks bore the burden and heat of the day. Without the loyal co-operation of his men he could not have been a successful soldier. Sir Granville recounted in a most interesting way the stirring deeds done in "that hell-hole, Gallipoli," and on the Palestine front. The Jordan Valley, he considered, was the worst place in the world, 80 per cent of his men having been laid low with sickness. ln France, he had been told by Frenchmen, that the Australians were the saviours of Amiens; had Amiens fallen Paris must have fallen, and after Paris, all France. Had France fallen Australia today might have been under the heel of the oppressor. Sir Granville then unveiled the artistically designed bronze tablet. The Sydney Morning Herald (NSW), 17 September 1923.